Eddie Vincent was a founding member and singer/songwriter for the seminal LA punk power trio The Hollywood Squares. Their single "Hillside Strangler" is a classic of the genre. He went on to found The Firm (years prior to the Jimmy Page/Paul Rodgers collaboration of the same name), another great unsigned Hollywood band that brought the house down in such famous venues as the Troubadour. Eddie’s work has been featured on radio and television as well as original CDs and compilations alongside such well-known artists as Iggy Pop and Devo. 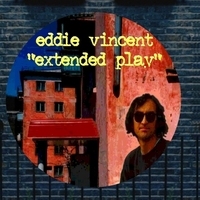 Still very much involved in music, “Extended Play” is Eddie's most recent CD offering. Eddie's unique style combines lyrical evocations of time and place with a sometimes heavy, sometimes ethereal guitar- and vocal-driven vibe. Look for Eddie’s interview in the upcoming Australian TV and Netflix series “Killer Soundtrack”.